For Engineering, procurement & Construction industry, accurate analysis of technical documents and translating constructive terms into meaningful information is not a necessity, it is a must! 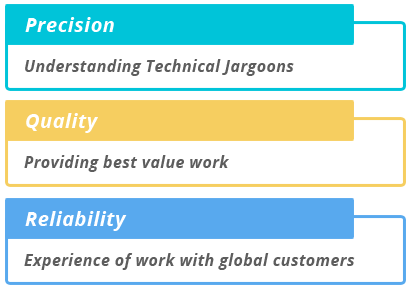 Low-quality translation of highly crucial technical documents often end up with a set of inter aligned issues for a company – reduced brand identity, reputation attacks, besides legal tangles and exposure to unforeseen liabilities. To counter such issues, companies working in engineering and construction sector need to rely on the expert help of skilled language and technical translators. At Rephraserz, we hire skilled translators with technical, legal and linguistic know-how so that they can work for you with you on your assignment leveraging their skill, understanding of the topic and experience of working on similar projects. Precision and reliability are what keep our valued customers coming back for our offerings. Our engineering and technical translation services have helped companies lower their communication investment, connect with local audiences, stabile their functions, and diversify their operations. With us as your preferred translation service partner, you can improve your overall market score while working on your core functions.